New Delhi : Who could think that the signature style of Bollywood Badshah will work for social cause! But, Assam Police did. A police officer from Assam gave a twist to Shah Rukh Khan’s nonchalant hands open wide filmy pose. Using his iconic pose on a poster, the cop urged citizens to follow traffic rules, hitting the right chord. The photo was shared on Twitter by Ponjit Dowarah, Assistant Commissioner of Police, Jalukbari, Guwahati City and got appreciation by the users of the micro-blogging site, lauding him for using his signature move for a greater and pertinent cause. Following the same idea, the social media team of Assam Police gave it a further twist by incorporating famous dialogue from Kuch Kuch Hota Hai. 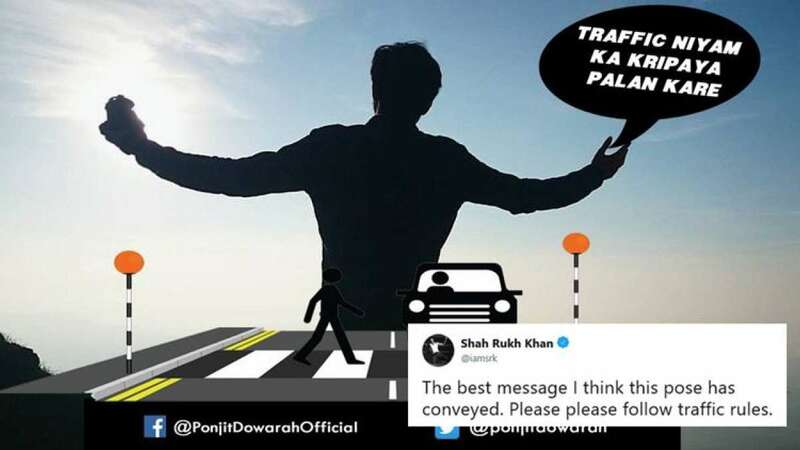 Giving a twist to KKHH dialogue, ‘Kuch-kuch hota hai Rahul, tum nahi samjhoge’, they wrote, “Traffic niyamon ka paalan nahin karne se kuch-kuch nahin, bahut kuch hota hai… (Not something but a lot can happen when not following traffic rules),” they wrote online thanking Khan for his support. Earlier this week, Assam Police received thumbs up online by preventing a girl from committing suicide after her Facebook status was spotted by their online safety wing.